Among the most successful categories of art released by all studios, the hand-painted cel and lithographic model sheet background captures both of the key ingredients in the animation process. 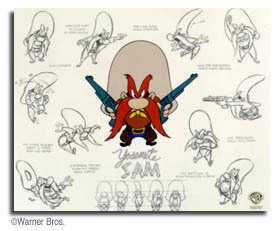 This edition is the first in this category featuring Yosemite Sam. The fantastic background features eleven classic moments featuring the antics of this famous cowboy. Any collector of the cel and model background series, any Yosemite Sam collector, and any classic Warner Bros. collector will want this edition in their collection.